Advanced Education  Minister Amrik Virk got a hands-on demonstration today of a haul-truck simulator during a visit to the College of the Rockies . The college bought four stationary haul-truck simulators and one mobile simulator through funding totalling more than $2.8 million. Funding sources included $580,000 from the Province, $560,000 from the Columbia Basin Trust, and more than $1.7 million through Western Economic Diversification. The provincial government funding is part of a $17-million investment in public post-secondary institutions across British Columbia to upgrade skills training equipment in line with the BC Skills and Training plan commitment to ensure students have access to the right training tools that will equip them with the skills regional economies need. The simulators run through real-life scenarios and help students gain hands-on experience that complements their classroom and online instruction. The first intake of students to benefit from the new equipment was in August at the college’s Fernie campus and September at the Cranbrook campus. The programs run on a monthly basis, with the next intake of students due on Oct. 28, 2013. A 2012 report by the Mining Industry Human Resources Council, in conjunction with the Mining Association of BC, showed that heavy-equipment operators and truck drivers will be the top two mining sector in-demand occupations in the next 10 years. The forecast shows that of 11,330 workers needed in the B.C. mining industry, 6,370 will be needed in the Kootenays. 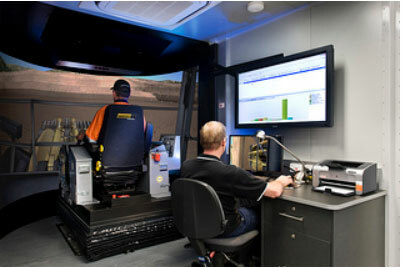 1 Comment To "Kootenay Students Benefit From Haul-Truck Training Simulators"